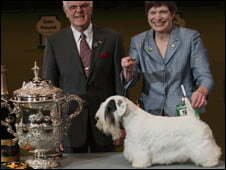 Crufts may have taken place this year without the sponsorship from Pedigree or the RSPCA, and without the backing from the BBC, but one terrier name Charmin couldn’t care less, as he’s just won the ‘Best in Show’ award at Crufts 2009. The RSPCA, Pedigree and the BBC pulled out of the event over claims that dog breeders weren’t doing what was best for the dogs in a BBC documentary. That hasn’t tempered Charmin’s excitement, nor that of his owner, Margery Good. It didn’t stop the crowds flocking to the event, held in Birmingham’s NEC, either. He’s such a special dog. He is my best buddy. He proved himself tonight and made every step just right. It’s been a very exciting evening. As well as winning the ‘Best in Show’ award, Margery would now be able to charge a much higher fee for Charmin’s services as a stud dog, as Crufts winners are highly sought after by the top dog breeders as stud dogs. Despite the controversy surrounding this year’s Crufts, 28,000 dogs took part in the show, which is the third highest in the show’s 118 year history. With the loss of the BBC, and no other channel picking up the event, the Crufts 2009 show was broadcast live over the Internet by the Kennel Club.